I can’t swing a cat on the Internet without hitting another cat. This trend is holding true for video games as well thanks to Mexico’s own Lienzo, developer and publisher of Hunter’s Legacy: Purrfect Edition. 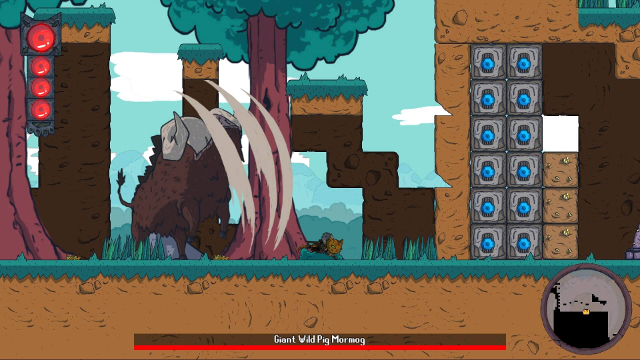 Originally released on PC in 2016, Lienzo took the original Hunter’s Legacy on Steam and made various upgrades and additions to it before releasing it on the Nintendo Switch last December. Let’s see if this Metroidvania platformer is the cat’s pajamas, or just something the cat dragged in. In other news, I’m banned from making any more cat puns for the rest of the review. Let’s get the obvious question out of the way: what’s different between Hunter’s Legacy and the Purrfect Edition? According to Lienzo, a lot. Extra story sequences and character dialogue were added. Various movement animations were updated. Melee combat got a facelift and level designs were altered, with extra secrets hidden across several levels. I didn’t play the original version, so I’m going into this mostly blind and simply judging it by its own merits, not by whether it is or isn’t better than the first release. With that out of the way, on to the cats! Stare into the blocks long enough, and the blocks stare back. Hunter’s Legacy focuses on Ikki, a huntress charged with the task of saving the Iripur kingdom from a shadowy evil led by the mysterious Morodir. To do so she must track down three elemental orbs to destroy the barrier blocking the way to his castle, then strike him down and take back a holy relic which helped protect the land. Bits of story get dropped in the middle of maps at various statues, recounting the rise and fall of the original savior and how a new hunter will take their place. These are optional and while nice to have, the story still comes off as pretty paint-by-numbers. I found the twist near the end to be too telegraphed, and these extra expository blurbs didn’t help on that front. Dialogue from other NPCs in the game wasn’t as bad about this, but when I sat down to write this review I realized I couldn’t remember a single character’s name outside of the one I played as. While the story isn’t the strongest, the gameplay of Hunter’s Legacy is fairly solid. Ikki starts the game with just a pair of swords and gradually gains new weapons and abilities as things progress, some of which are necessary to access certain areas. 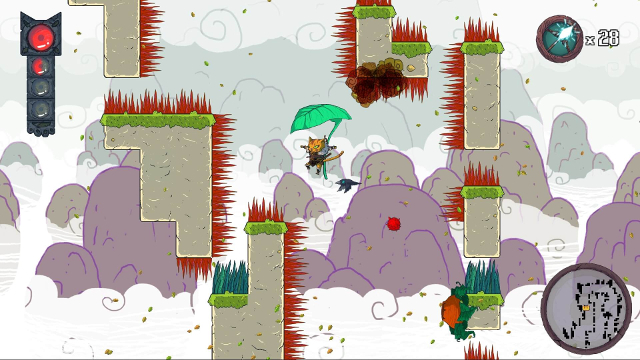 Each level has plenty of sections which require backtracking after gaining new abilities. 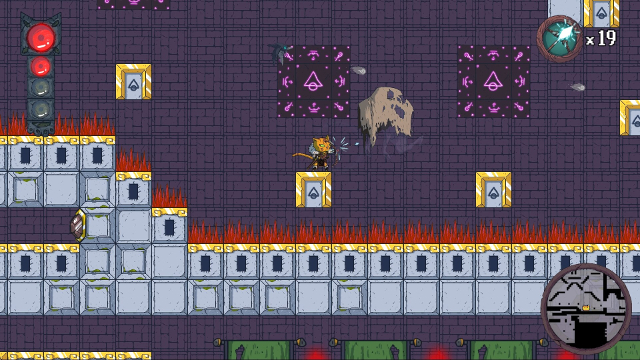 For example, the downward strike or magic arrows can break through specific types of blocks. Ikki has a quick four-attack combo which can be done up, down or straight ahead, in addition to a bow which can be aimed in any direction with the control stick. However, in mid-air she can only attack forward. It’s minor, but it sometimes means using the bow and its finite number of arrows at inopportune or awkward times. Defeating enemies and opening chests usually yields two kinds of rewards: money and ore. Both are spent mostly in a town reminiscent of Shovel Knight’s village. They can be spent to help upgrade Ikki’s attacks (e.g. stronger sword strikes or charging magic arrows faster), increase Ikki’s health bar or, if she’s really low on health, buy a refill from the town healer. The catch is her money, as well as her arrows, are limited by how big her wallet and quiver are. Hidden in various levels is Rampelkimper, a strange guy who offers to sell you something which turns out to be a bigger wallet or quiver. I usually found him by accident while slashing through tall grass looking for health, but even with the best wallet there were so many chests scattered around that I was maxed out on cash most of the time. There needs to be something else that uses money and not ore to help balance things out. 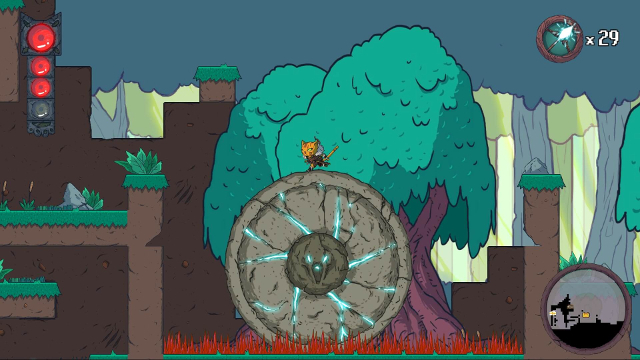 To make travel easier, each level also has a teleporter, able to send Ikki to any other active teleporter on the map. 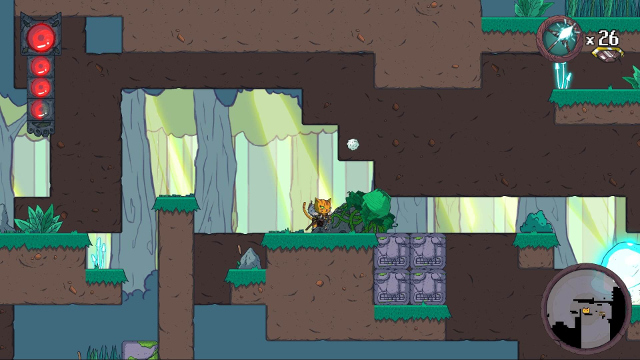 Every level also has a mini-map in the corner of the screen, new to the Purrfect Edition of Hunter’s Legacy, showing where each unopened chest is and whether it holds money or ore. Helpful, but markers for things like doors, teleporters and checkpoints would have been more helpful. On that note, checkpoints only come into play for dying. Many levels involve platforming over death pits, but they’re more like “take away one point of health and respawn near the last jump” pits. Despite this, I’d struggle to call Hunter’s Legacy challenging, for reasons I’ll explain in a bit. Sadly, this isn’t nearly as intimidating as it looks. Areas in Hunter’s Legacy include plains, swamps, volcanoes, and temples among others. They tend to have unique obstacles to deal with, like ice physics or wind pushing Ikki around. Everything runs smooth docked or undocked, except when more than five or six enemies are onscreen and it locks up for a moment. In terms of graphic design for the world though, there isn’t much to look at. It’s all perfectly fine for what it’s supposed to do, but not much stands out. The music tends to fall into the same trap, being appropriate for what it’s supposed to play over but none of the songs stuck with me. Sound in general has the same issue, except for Ikki’s voice. While she only makes various attack and damage grunts, the voice not only sounds like it’s for a different character entirely, but that the actress had no context and one take to record everything. Levels tend to be designed like a tree branch; there’s one clear direction it’s going with the occasional short diversion along the way. There are exceptions, of course, like when wind physics and gliding come into play for one stage. The volcano has a clever little section where Ikki needs to get ice globs stuck to her to survive running through some high heat tunnels. Plants shooting bubbles or exploding pods add a bit of puzzle solving to the mix too. If Ikki dies along the way though, the only penalty is moving back to the last checkpoint, which are plentiful enough that losing progress isn’t a serious penalty. Big wheel keeps on turnin’, proud huntress keep on purrin’. The platforming in those levels, aided by responsive controls and ledge grabbing, feels natural and I adjusted to it almost instantly. Adding a mid-air dash to the mix, which can also dodge through attacks, didn’t take long to get used to either. My one issue on this front is that the difficulty curve for platforming, and enemies for that matter, stays pretty low until the last level when it abruptly spikes up. Enemies in Hunter’s Legacy tend to be Goomba-like for the bulk of the game before varying much more a few levels from the end. Even the bosses present little challenge save for two, one of which is the final boss. From start to finish, Hunter’s Legacy took me just under four hours to finish. I get the feeling that I wasn’t supposed to get through the game that fast, considering I only bought two health upgrades and one upgrade each for the swords and bow. For the Purrfect Edition though, an additional mode exists called Hunter mode. It’s harder overall, but Ikki starts with all abilities and both the swords and bow. I’d like to be able to play it without overwriting the same profile, particularly with only three save slots, but that’s not an option. This boar-ish behavior will not be tolerated. 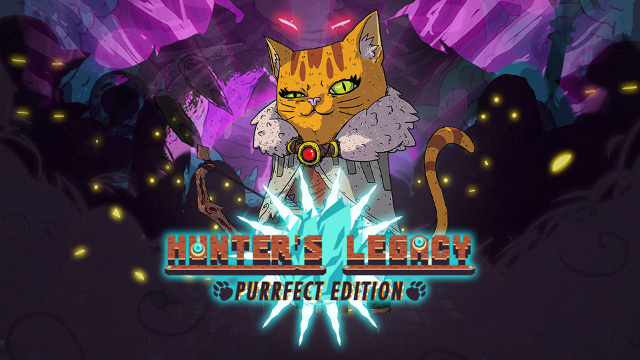 Hunter’s Legacy: Purrfect Edition, based on what I know about the original release, feels like a more complete version as far as functionality goes. That said, as a game the highest praise I’d give this is that it’s acceptable. It’s the American cheese of video games: it does what it’s intended to do, but is otherwise disposable and there are better options out there. For just $6.99 on the eShop though, it might be worth your while, especially if you intend to complete Hunter mode as well.